This recipe is an addition to my previous post. But this time, I added bacon. And yeah, it was THAT good. Serve this up as a passing hors d’oeuvre at your next dinner party and your guests will be oooh-ing and ahhh-ing in excitement. 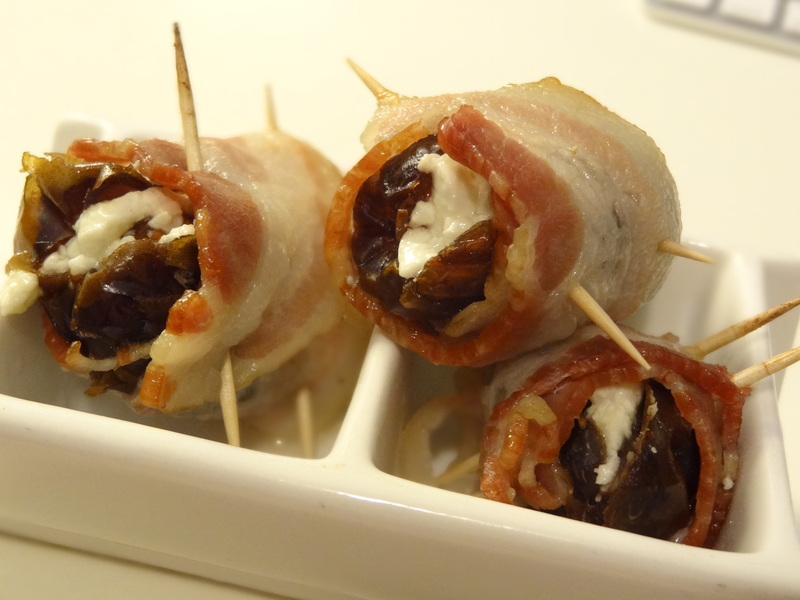 Stuff each date with goat cheese, one almond, wrap with bacon strip and secure with a toothpick (or two). Place on baking sheet and bake for 10-12 minutes. In my 27 years of existence, I have never eaten a date before. Raisins? Sure. Prunes? Yep. But, never a date! I recently learned a new recipe from a colleague and thought to myself… wow, another new food item to try! Last weekend, I picked up a box of fresh Medjool dates from Trader Joe’s ($4.49/16 oz). There were about 25 dates in the container. Plenty to help my exploration of tasty date recipes. Ever since going (semi) Paleo, I’ve really cut out a lot of dairy. I’ve switched to almond milk and have limited my yogurt and cheese intake. I’m a huge fan of cheese, but choose to stay away from it for several reasons; it usually upsets my stomach (I’m probably lactose-intolerant) and it’s high in fat. I’ll never be able to fully give it up because it tastes SO GOOD (of course, in moderation). My two favorite cheeses are Parmesan and goat cheese… delicious. Goat cheese is actually one of the “healthier” cheeses, low in calories, fat content, and actually contains less lactose than cow’s cheese. 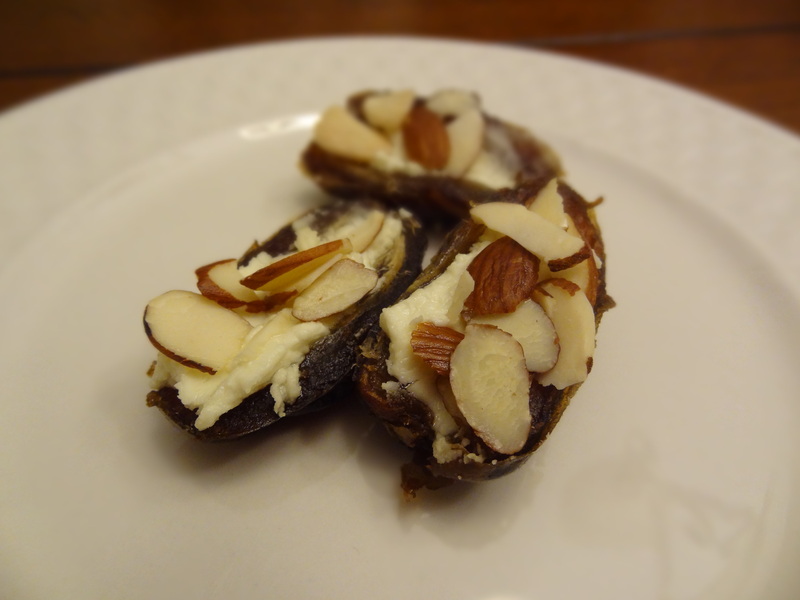 So, when I found out that goat cheese paired well with dates, I knew this recipe was a winner. Here’s the first of three date recipes… more to come! Stuff each date with goat cheese. Sprinkle sliced almonds atop. Place on baking sheet and bake for 8-10 minutes.